Greenhill has been awarded over $7,000 from PNC to expand the reach of free Family Night. Having served 3,000 children and families in 2014, Greenhill is looking to increase this number by 25% to serve an additional 750 annually. Greenhill recognizes the need to reach more community members through the Family Night programs and with added funding from PNC, it will be able to provide an additional staffing and art supplies to support and guide increased numbers of children and families. Family Night is a long standing tradition at Greenhill. Since 1996 Greenhill has offered Family Night, a program which provides children and families free access to ArtQuest and The Gallery on Wednesday’s from 5-7 PM. 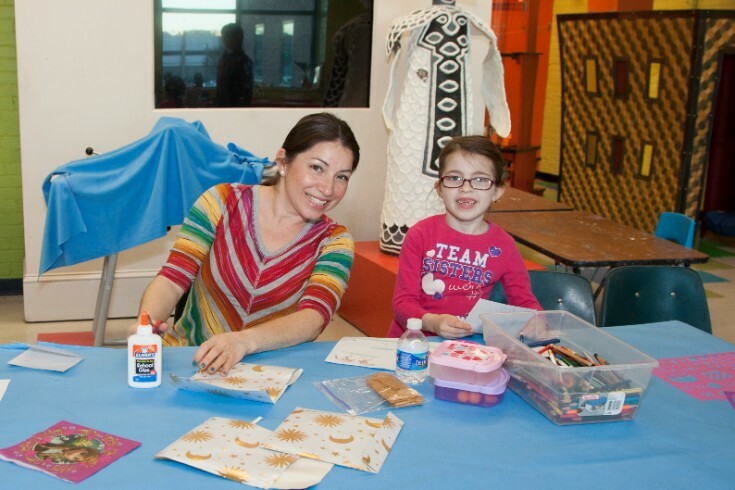 Comprised of four interactive studios, the ArtQuest studios are active, social spaces where families can make art and share ideas, create one-of-a-kind paintings or work with clay or new and unexpected materials at the hands-on exploration table. The Art Works Studio contains large painting easels, table-top projects, and a clay station; the Scrap Lab offers and array of recycled materials to make the old into something new and creative, the Imagination Station is geared to the youngest visitors and offers books, blocks and puppet making with a puppet stage for children to present their own stories; and the NC Art Studio is an open space for drawing and other activities. 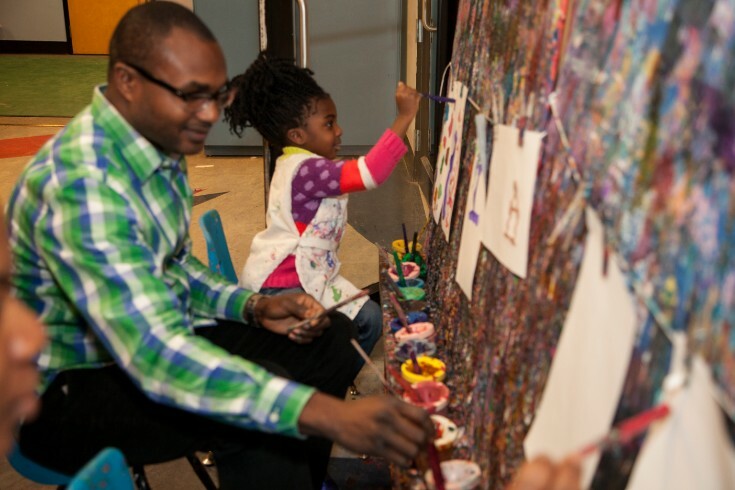 Father and Daughter paint in the Art Works Studio during Family Night. Mother and Daughter work together on a collage in ArtQuests NC Art Studio. Benefits of participation in the arts cannot be understated. Studies show that underserved students who have access to the arts in or out of school also tend to have better academic results, better workforce opportunities and more civic engagement. Surveys taken over a month indicated 90% of Family Night participants attend because it is free of charge, exhibiting the need for Family Night. The PNC Foundation, which receives its principal funding from The PNC Financial Services Group (www.pnc.com), actively supports organizations that provide services for the benefit of communities in which it has a significant presence. The foundation focuses its philanthropic mission on early childhood education and community and economic development, which includes the arts and culture. Through Grow Up Great, its signature cause that began in 2004, PNC has created a $350 million, multi-year initiative to help prepare children from birth to age 5 for success in school and life. For more information, please visit www.pncgrowupgreat.com or follow www.youtube.com/PNC. Greenhill is located at 200 North Davie Street, in the Greensboro Cultural Center. Greenhill promotes the visual arts of North Carolina by engaging a broad community of artists, adults and children through dynamic exhibitions and educational programs while providing a platform for exploration and investment in art. For more information visit www.greenhillnc.org.